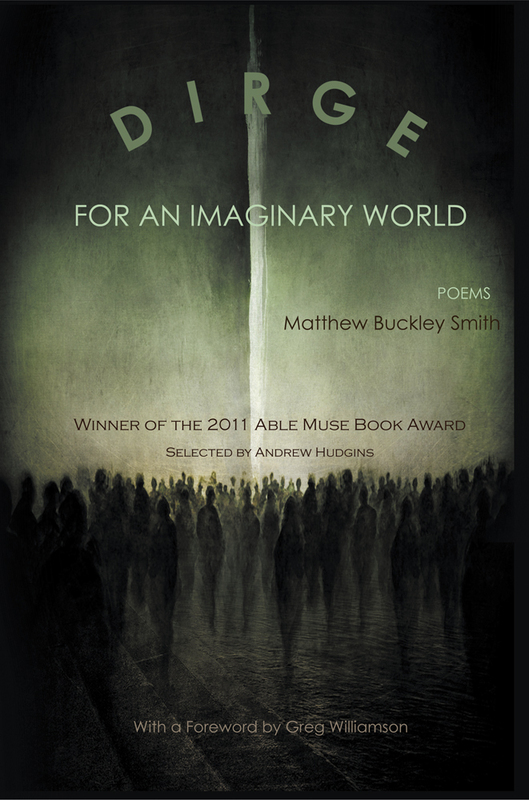 Dirge for an Imaginary World from Matthew Buckley Smith is the winner of the 2011 Able Muse Book Award, selected by Andrew Hudgins. These are poems of breathtaking craftsmanship that find inspiration in the simplicity of the quotidian, or the perplexity of the grand. Smith is equally at ease musing about Neanderthals or God as he is with a ballet exam or highway medians. These poems of personal and universal introspection are filled with grace, and sparkle with abundant intelligence and wit. This masterful debut collection is an event to celebrate. Wildness and precision and passion balanced with wit—there are the hallmarks of Matthew Buckley Smith’s superb Dirge for an Imaginary World. In subjects great (“For the Neanderthals”) and small made great (“For the College Football Mascots”), the comic is rich with serious intent and gravity lightened with discerning wit. But only a poet who lifts heavy and unwieldy subjects—death, lost love, the absence of god—knows the imperatives of graceful balance. 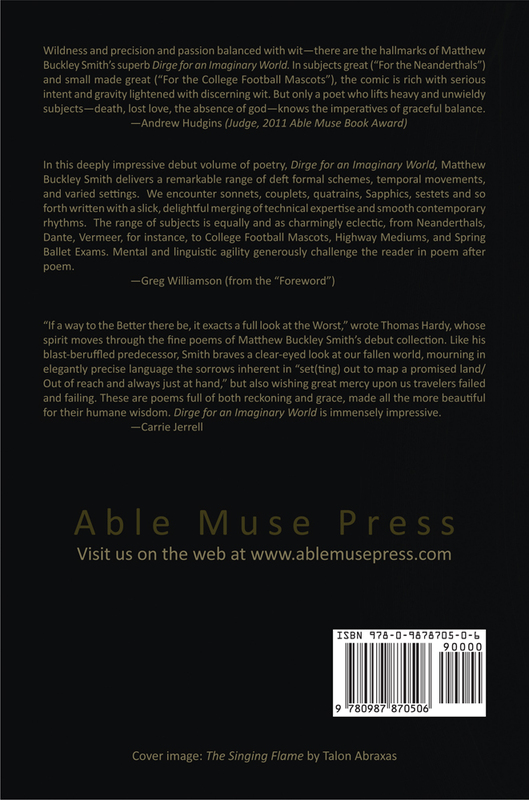 In this deeply impressive debut volume of poetry, Dirge for an Imaginary World, Matthew Buckley Smith delivers a remarkable range of deft formal schemes, temporal movements, and varied settings. We encounter sonnets, couplets, quatrains, Sapphics, sestets and so forth written with a slick, delightful merging of technical expertise and smooth contemporary rhythms. The range of subjects is equally and as charmingly eclectic, from Neanderthals, Dante, Vermeer, for instance, to College Football Mascots, Highway Mediums, and Spring Ballet Exams. Mental and linguistic agility generously challenge the reader in poem after poem. “If a way to the Better there be, it exacts a full look at the Worst,” wrote Thomas Hardy, whose spirit moves through the fine poems of Matthew Buckley Smith’s debut collection. Like his blast-beruffled predecessor, Smith braves a clear-eyed look at our fallen world, mourning in elegantly precise language the sorrows inherent in “set(ting) out to map a promised land/ Out of reach and always just at hand,” but also wishing great mercy upon us travelers failed and failing. These are poems full of both reckoning and grace, made all the more beautiful for their humane wisdom. Dirge for an Imaginary World is immensely impressive. Matthew Buckley Smith was born in Atlanta, Georgia. He earned his MFA in poetry at the Johns Hopkins University. His poems have appeared, or will soon appear in various magazines, including Beloit Poetry Journal, Commonweal, Iron Horse Literary Review, Measure, The Alabama Literary Review, Think Journal, and Best American Poetry 2011. His poetry has been nominated for a Pushcart Prize. He lives in Baltimore with his wife, Joanna.